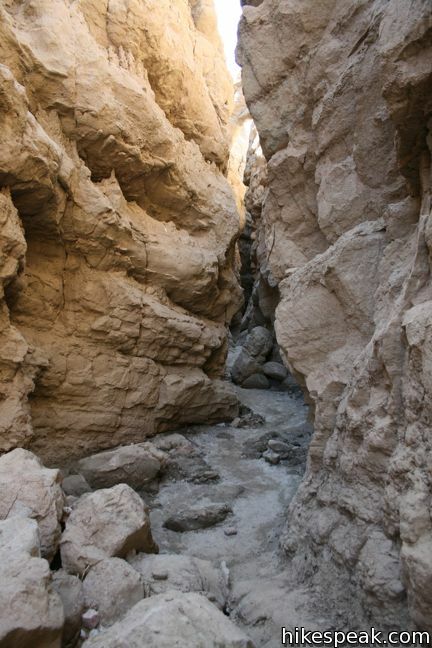 Simply named The Slot, this narrow siltstone canyon provides one of the most exciting hikes in Anza-Borrego Desert State Park. 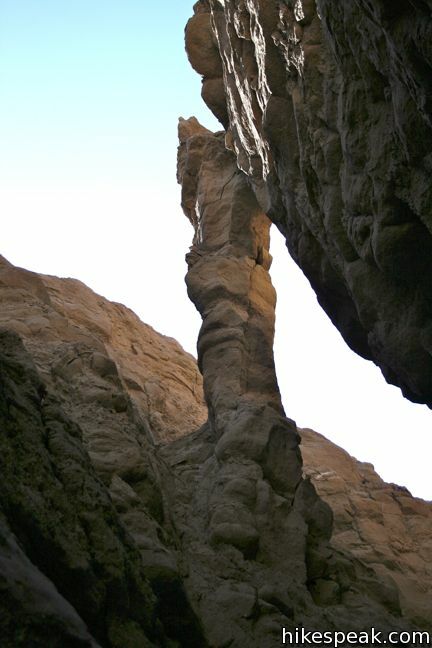 This 0.8-mike trek is capped off with a passage beneath a gravity-defying rock span. 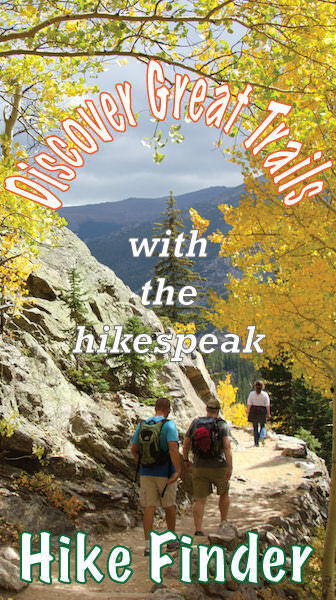 This short hike has just 100 feet of elevation loss, but the memory will be much more profound. The Slot lacks a defined trail marker. From the parking area, look for footprints leading down into the ravine below. Left of the trailhead, just to the right of a dirt road continuing east, is a wide path that appears to descend into the canyon. This is not the way. The winding trail cliffs out above a dry falls in a side canyon above The Slot. The correct route is the narrow steep-looking track that drops right off the rim of the ravine, straight ahead from the parking area. Slowly descend into the trench. The trail is steep, but not nearly as steep as it looks from above, dropping less than fifty feet. There are no more optical illusions from here, just eye-popping natural wonders. Turn left and venture down to The Slot. The siltstone walls grow taller and closer together. 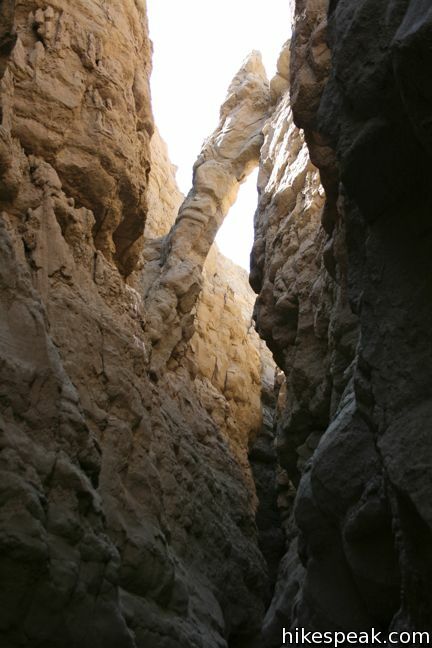 A tenth of a mile from the start, the canyon becomes quite narrow. Hopefully you did not eat a big breakfast, because you will need to squeeze through course walls that are shoulder width apart, and less in places. 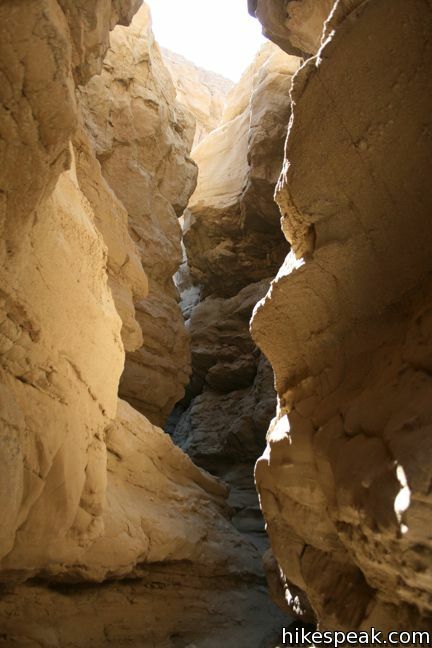 The shaded slot provides cool relief from the desert above. 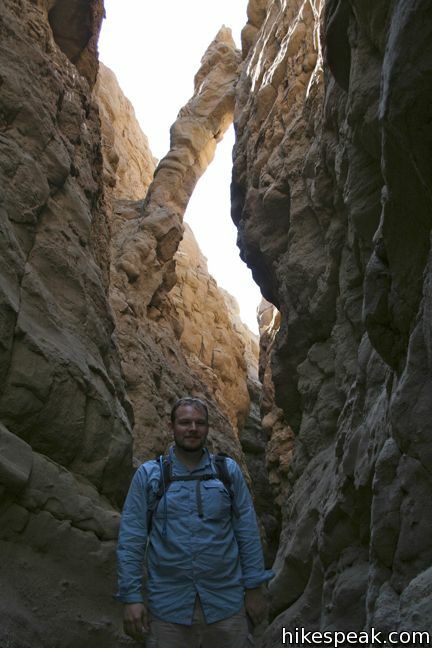 Progress through the narrows for 0.3 miles to the highlight of the trek, a slanted rock slab bridging a narrow gap in the canyon. This scepter-shaped block appears to have broken off one wall and come to a comfortable resting place between the two. The precarious feature could fall at any moment, but it remains lodged overhead, trapped in some loophole of the earth’s gravitational pull. Not far below, the canyon widens and the trail meets the top of a jeep road. One option is to walk down this road a ways to a junction, and turn left to loop back to the start, adding over a mile to the hike. 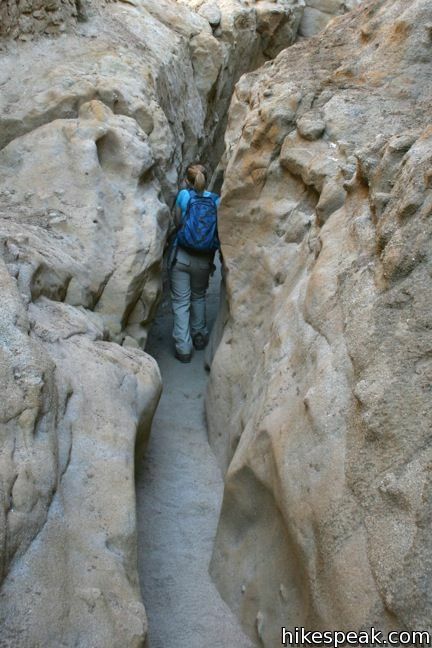 It is probably better to turn around when you meet the road and hike back up through the slot. The trail is enjoyable a second time (and several times more). 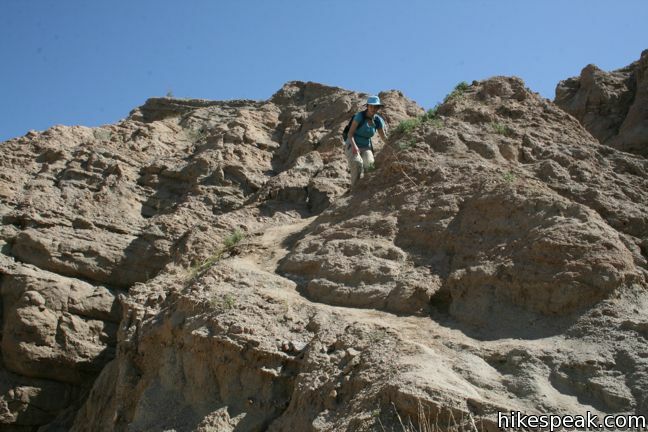 To the north of the parking area, a trail ascends to the 1,207-foot summit of West Butte in the Borrego Mountains. From the summit, one can hike west along a ridge to the dirt road below The Slot, and return to the trailhead through the canyon for a 3.5-mile loop. 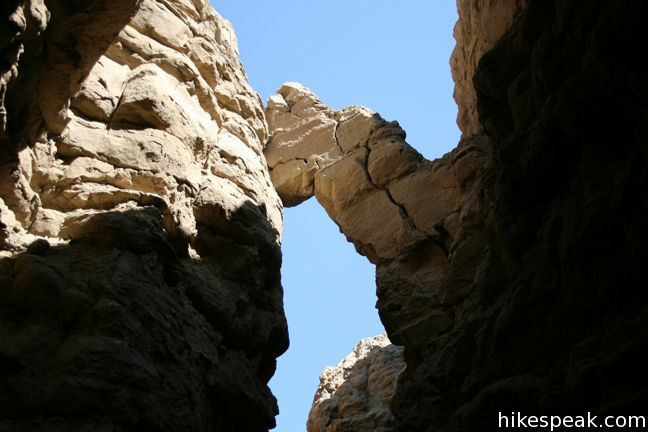 No fee or permit is required to hike The Slot in Anza-Borrego Desert State Park, so get out and enjoy! 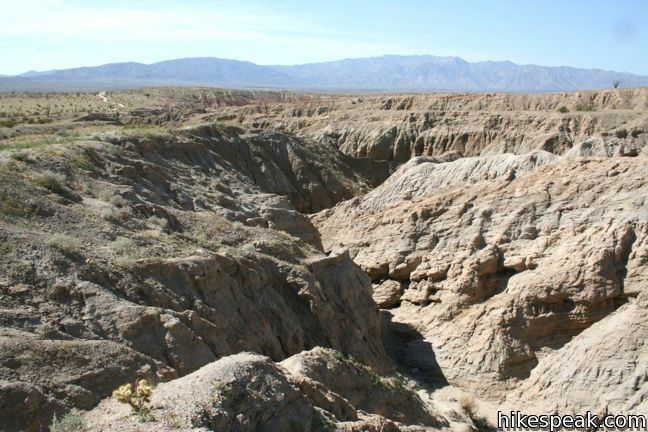 To get to the trailhead: From Christmas Circle in Borrego Springs, drive 11.5 miles southeast on Borrego Springs Road. Turn left on Route 78 East, drive 1.5 miles, and turn left (north) on a dirt road marked Buttes Pass. Drive one mile up this dirt road to a fork, and continue to the left up Borrego Mountain Wash. Go another mile to the parking area for The Slot. 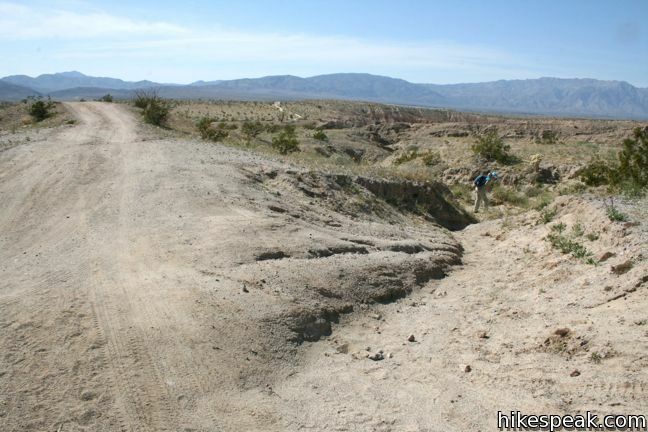 Low clearance vehicles should be able to drive all the way to the trailhead at the end of the sandy dirt road. 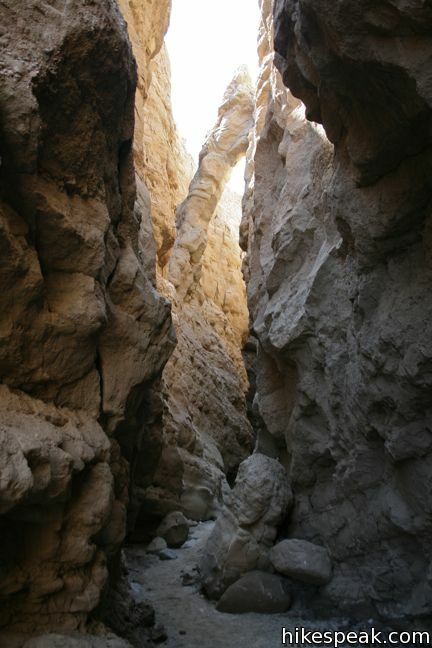 Hiking through "The Slot" in Anza-Borrego Desert State Park by hikespeak.com. 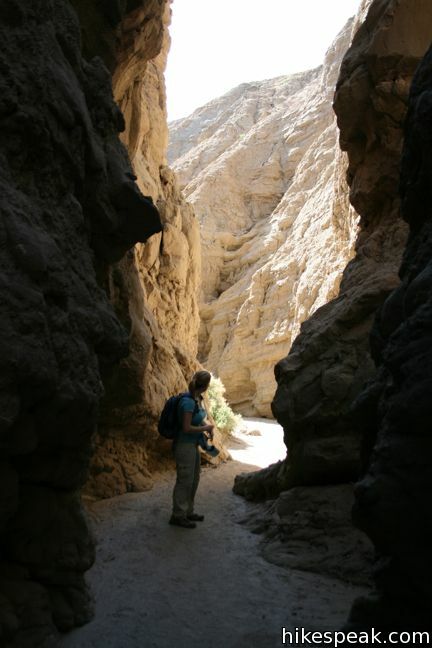 This 2 to 4 mile hike requires a bit of climbing and is a lesser-visited trail in Death Valley. 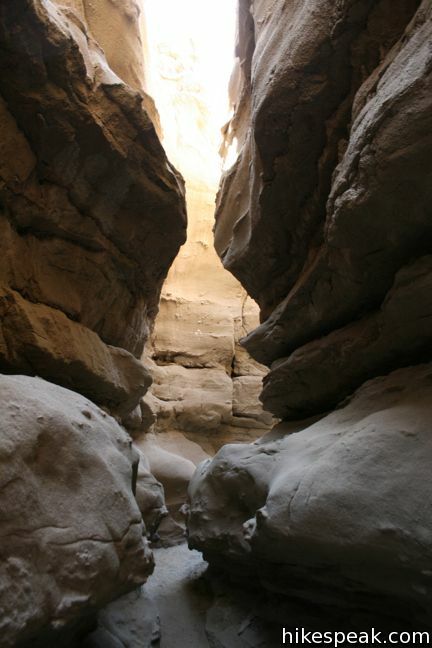 This 4 to 7 mile hike visits narrow slot canyons full of pour-overs, carve outs, and dark passages that beg to be explored. Four developed campgrounds, eight primitive campgrounds, and extensive roadside camping accommodate visits to California's largest state park. Is this hike suitable for elderly people who are mobile but slow – walk with a cane ? Is this too difficult for senior citizens? I think the hike would not be so suitable for canes. 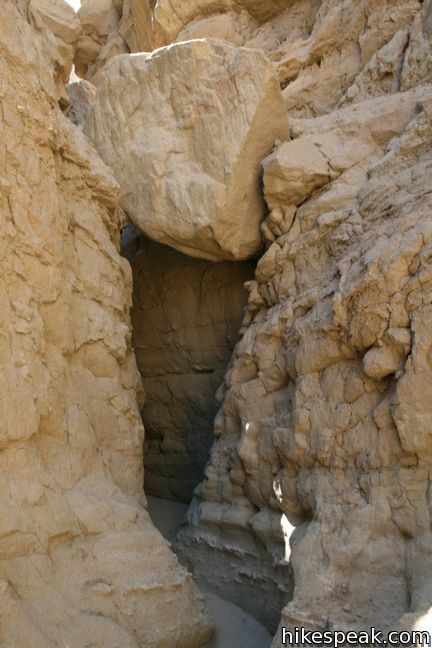 I was there this weekend, and although a great little hike, it can be very sandy in some spots, a few little tight spots, and a little climbing (very little). It seems that there would be the opportunity to slip with the cane in my opinion. I want to plan a trip to your state park the weekend of October 14-15, 2017 and wanted advise on what is the best time to start a hike from the Hellhole Canyon to Maidehair Falls? 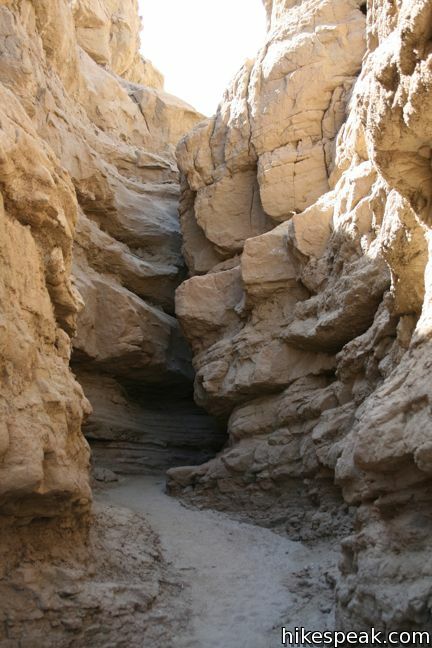 If we choose not to camp at the anza-Borrego campgrounds, is there parking available where we can park prior to starting our hike? 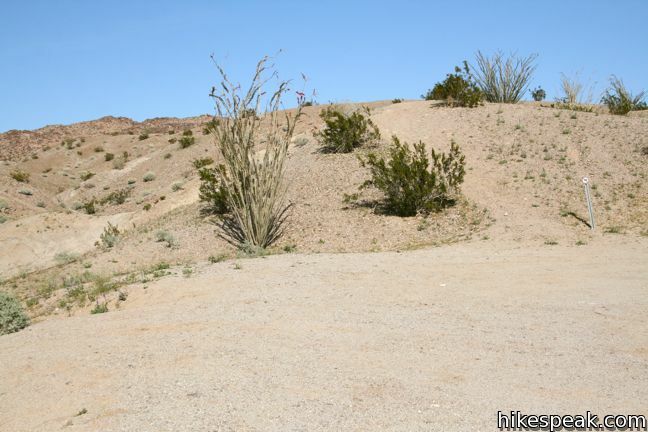 Is Borrego Wash difficult to drive with front wheel drive? Or can it make it to the slot parking? What type of vehicle did you have when you visited? The trail access information for the slot in this article is incorrect. A proper trail head with a more gentle descent has been built off the wider trail at the right of the parking area. Follow the marked signs to the trail marker. Do not take the steep route down through the parking lot. There are some caution signs posts now but we did it anyway based on the advice in this article, which was a mistake!